One of the apparent contradictions which has puzzled observers of East Asian politics is why, despite the region's considerable economic integration, economic governance institutions remain largely underdeveloped. This book stems from the observation that the study of actual forms of economic governance in Asia has been impeded by the dominance of a ‘regionalism’ problematique. Scholars have focused on the emergence – or not – of regional multilateral institutions, seeking to evaluate these institutions’ capacities to enforce disciplines on Asian states. 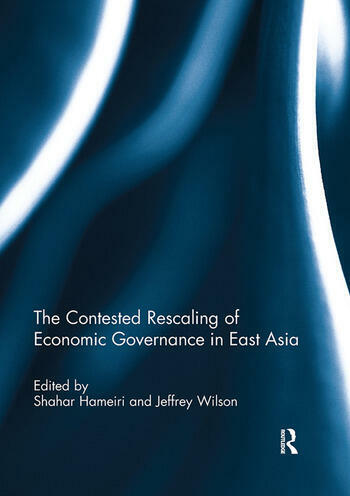 However, they have also neglected prior, and more pertinent, questions regarding the causal determinants of regional economic governance, which animate the contributions to this collection: What factors shape the scale and instruments of economic governance in Asia; and how and why is economic governance being rescaled between the sub-national, national and regional levels? In the chapters of this book, the contributors explore the social and political struggles over the scale and instruments of economic governance. They identify and explain the emergence of a wide variety of regional modes of economic governance, explain the factors shaping the spatial scale of economic governance in Asia, and discern the patterns of regional integration to which they give rise. This book was originally published as a special issue of the Australian Journal of International Affairs. Shahar Hameiri is an Associate Professor of International Politics, and a Fellow of the Asia Research Centre, at Murdoch University, Australia. Jeffrey D. Wilson is a Senior Lecturer in International Political Economy, and a Fellow of the Asia Research Centre, at Murdoch University, Australia.